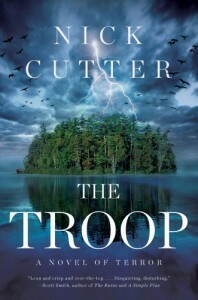 The Troop is not a bad book. And I'm sure it gets better in the second half. But I just can't get into it right now and forcing myself to read it when I'm in no mood to appreciate it seems very unfair. So putting this on hold for now but I'll get back to it someday. It's well-written but very predictable. Knowing that these boys will soon go Lord of the Flies on each other is perhaps what is keeping me from caring about them. Some parts were disgusting, like one very detailed account of blatant animal abuse, but overall, nothing has genuinely spooked me. Buddy read with Jenny and Khanh. They weren't impressed either.